There are several trees on the island that I photograph over and over with the hopes to someday catch their essence with my lens. One of these trees is the one in the daffodil field. The tree has set itself in a delightful corner of the world that is often privy to dramatic or at least interesting light. 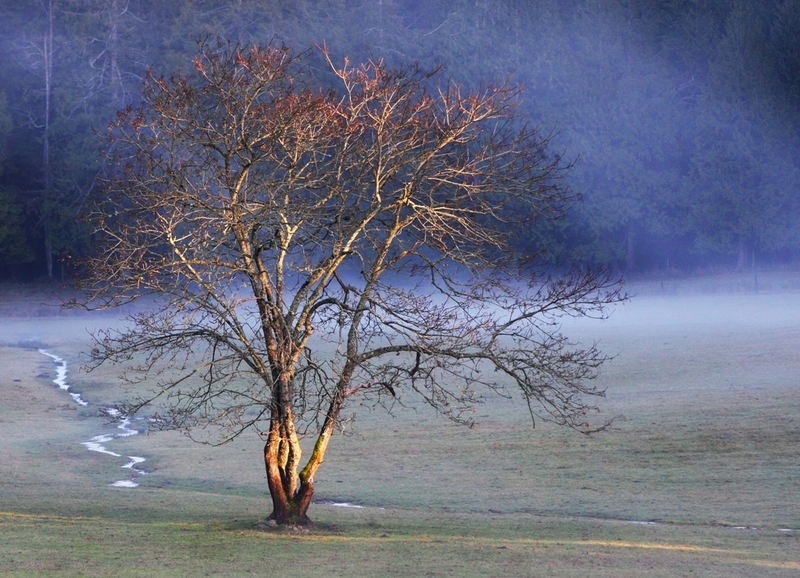 Like the other day when I spotted it with the fog starting to roll up behind its naked trunk and branches. But then I got distracted by its sister tree by the gate. 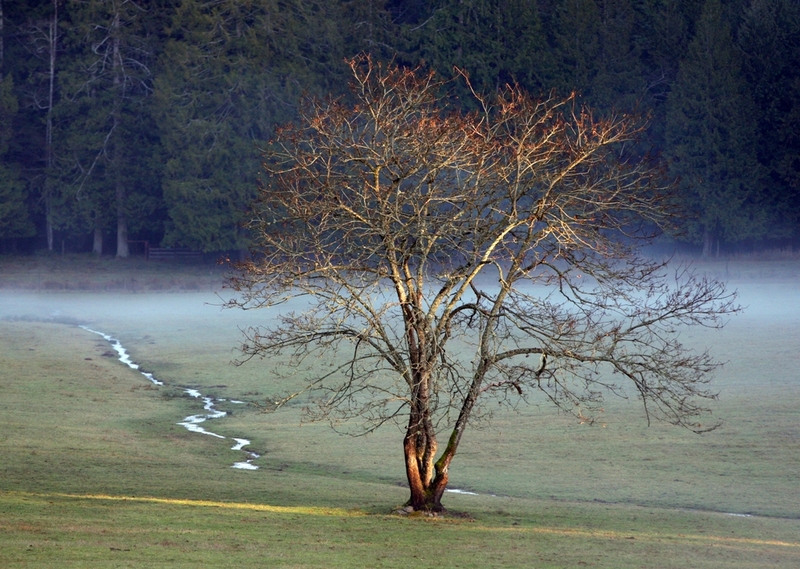 By the time I looked back, the mist had really started to drift up behind the other tree. It is lovely of course but is it just right? Can we glimpse the spirit of the tree as it is revealed to the viewer’s eye. No, I think not – not quite. Almost but still I am left feeling unsatisfied. Maybe it is time to tackle it with paint brush and canvas. Drop on by if it pleases you or subscribe so you are notified of new posts as they go up. What are you attempting to capture this week with you creative tools? ← Stop feeding the WOW-smacked dragon! Trees and the spirits within fascinate me. I look forward to seeing your paintings! I know what you mean, I am always on the lookout for a great tree! So true rkb665, glad you had a chance to drop in. I like how you see things Colleen and paints are ones you have likely watched as works in progress but it is still nice I think to see them in their final stage. I am trying to release some old angers today and let them go, which I believe are holding me back from the changes I need to make. Rather a tough day, I would not like to capture them any more…release, forgive, and begin again. Maybe Patricia if you are releasing the anger you will be in a position to capture something else…. Something really delicious and soul satisfying perhaps? Just a thought but it pleases me to think about the possibility. Thank you for you kind words about my work and stopping in today. Terrill – With trees being at the top of my list of favorite living things, you’ve got to know how much this post and the beautiful photographs resonate with me. Remember years ago when you posted a photo with a deer hidden in it (that was so darned hard to find! )…is this the same tree? 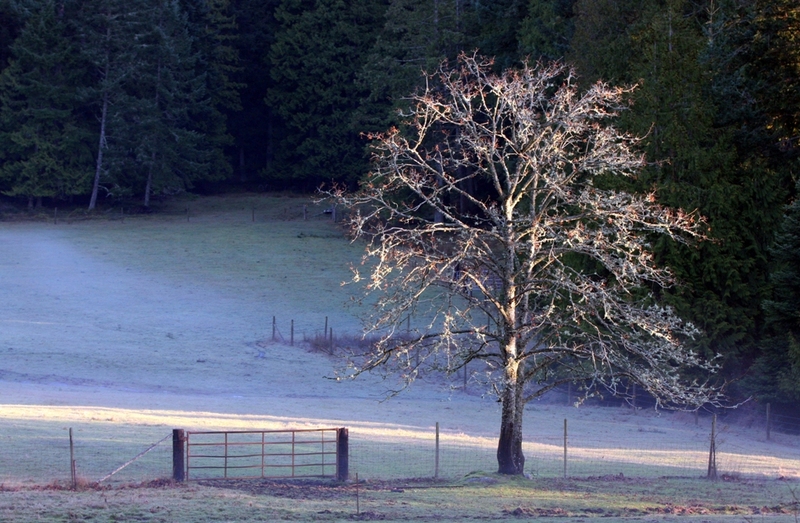 Yes Laurie this is the very same tree that was in the photograph with the deer hiding in it. I have no doubt that you will tame that lion of an article with time to spare. Good luck with it! I often think of your love of trees when I am photographing or painting them. It is a passion that we share and share with so many. Patricia’s book she is reading about our co-dependancy is probably part of our appreciation. what a wonderful photographs Terrill. i never success to capture any landscapes or scenery like that. and these are beautiful one, even the object is only a tree. it look simply dramatic. love it. Terrill, I am also a tree lover -as I’ve stated on this blog in the past- and I am simply ravished this morning by this indescribably beautiful photos, all stark, mystical and atmospheric. Every one has had me visually enraptured, and I am hoping at some point you may make them available on a calendar or collection. Yes, when you embark on a brush stroke transcription, there will be further magic woven into this subject, but the photos are really incredible, and proof of what photography can provide when it’s engineered by people with your feel for the environment. Bravo! I will see about what I can do to come up with a tree calendar Sam. That is a great idea! There is a practiced art to photographing the essence and essential in a nature photograph that in many ways is more difficult than people photography because the photographer must decide what the star of the image is going to be from the gazillion of choices before her or him. Along a similar vain except on the subject of painting I read the most delightful and inspiring interview with Italian painter Sigal Tsabari last evening. 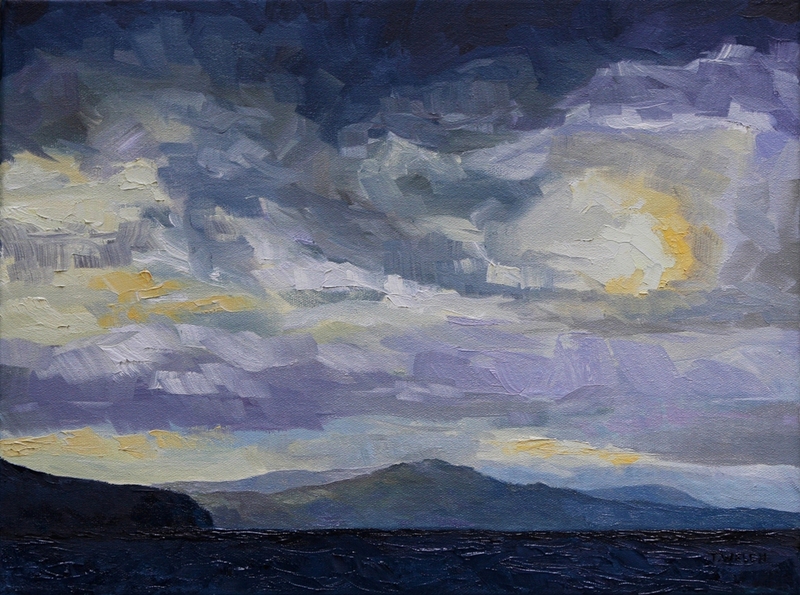 Here is the link just in case anyone else is interested http://paintingperceptions.com/landscape-painting/interview-with-sigal-tsabari Her work is extraordinary and most often is about the ordinary from her everyday life. The article includes maybe more than a dozen of her paintings. I look forward to digging around and reading more about her. Oh, and forgot to add that the photos remind me of Tarkovsky’s THE SACRIFICE. There are striking similarity in the images. Oh yes Sam! I remember this film well. For others, here is a tumbler link with many stills from the movie including several of the tree http://www.tumblr.com/tagged/offret?before=19 and more about the movie itself at http://en.wikipedia.org/wiki/The_Sacrifice I think it just about might be time for me to see this one again. Such a powerful work. Thanks for making this connection Sam. Lone trees can be gorgeous, indeed. 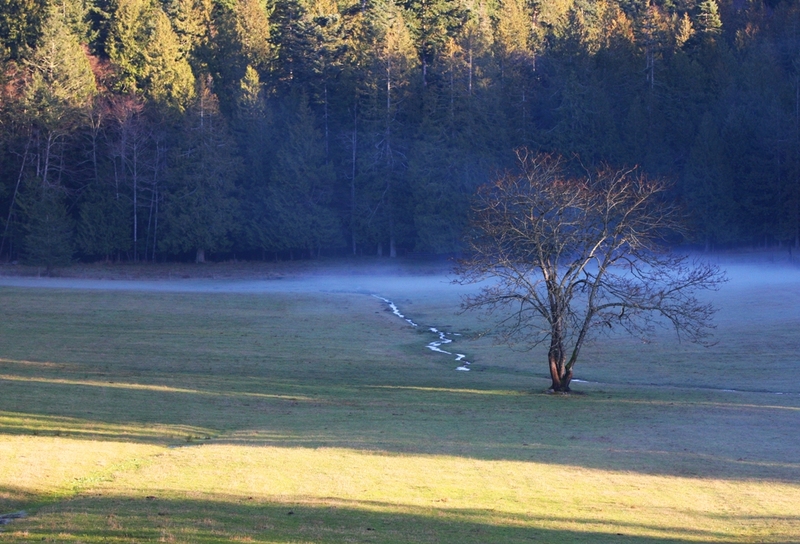 I especially like the first photo with that exquisite color of blue stream and background of fog. It’s never occurred to me to keep photographing an object in different lighting to capture a certain essence. Thanks for the prompt to possibly do that. You are most welcome Kathy. It is a practice that I think you will come to enjoy. Some really lovely photographs. The various color tones are beautiful. As for me this past couple of days has been about capturing a wind and rain storm with my video camera. Giving the storm my own feeling. Stop by and check them out. I will do that Walter. It sounds like you have an interesting project there.